In this post, I will give you a quick tutorial on how to find the right domain name with your main keyword into it, what you can register. When you decide to start blogging the first two things you should think about is your niche and great domain name who will rank well for your blog. You will need to be very serious about your decisions at that time because if you do it wrong, you easily can stuck with your project later. It’s essential to write about what you know in depth and also about what you’re passionate. So lets open a simple excel spreadsheet and write down topics in which you feel strong at, or topics, which you are dealing with in your everyday routine. After that let’s write in the next column what you would like to learn. Now have a look at your spreadsheets and think about the niche, as you see for me it will be something about web mastering, SEO, maybe photography. I would suggest you to choose the niche which is not too big. I know i can write about cooking, traveling, home decorating and fashion. But if my reader will come to search for a recipe, but the last three posts would be about trips, he wouldn’t want to scroll down till finding one recipe, most likely he will run away and never come back. The Internet is fast, and everyone wants to get information straight away these days. Your niche shouldn’t be too specific as well, for example, if you were to write a blog about particular link building technology from Wikipedia, you would run out of ideas for new blog posts very quickly, so instead of writing and promoting new posts, you would spend days or even weeks trying to find a new idea to write about. So think about blog post ideas in that stage, if you can quickly imagine maybe 20 post titles about which you can easily write about and you feel there is always something extra you can add, go for it. So I decided I will write about my webmaster experience, just because I can share my coding and traffic building experiences what I do every day with my readers. So I chose the main key word to be “webmaster”. Now let’s think about a domain name. There is nearly no possibility to register a single word domain (as webmaster.com), just because they are already taken or will be offered to you for a very high price from domain registrars as premium domains. Ok, so we need to add another word to our domain name what will be available to register with .com extension? Why you always should register your domain in .com zone? Well, just because .com extensions stay in people minds as the main used extension on the internet. If you will register for example yourname.info and after some time you will make it a noticeable brand, people will remember “your name”, and they just start typing your name in their browsers, which is fantastic. You don’t want that happens, right? So, i would suggest go for com. How to find the exact domain name what is available with your main keyword for a standard price? 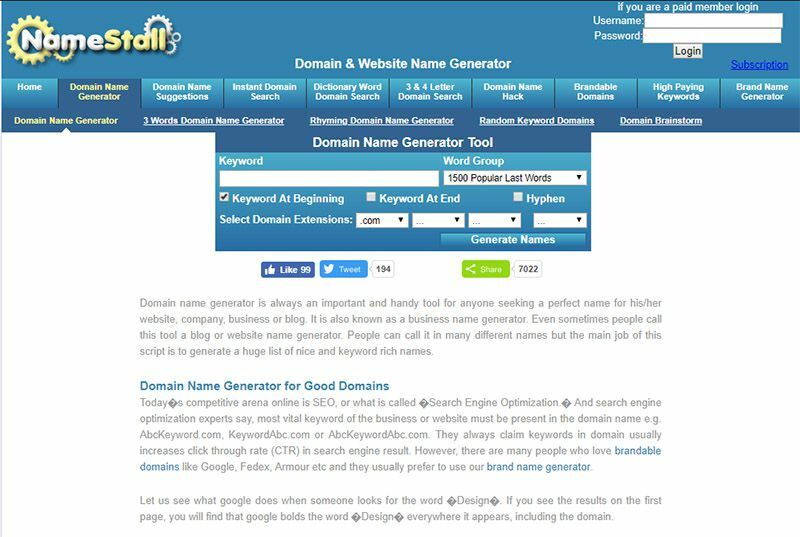 The main helper in this process will be online domain name generators. Here is plenty of them on the internet, but I will tell you about some I like and why. Why this is my favorite, well as you can see in the picture below it has to bring me 3999 available .com domains in just 0.949 seconds without offering me low-quality domain extensions (anything else apart from .com). 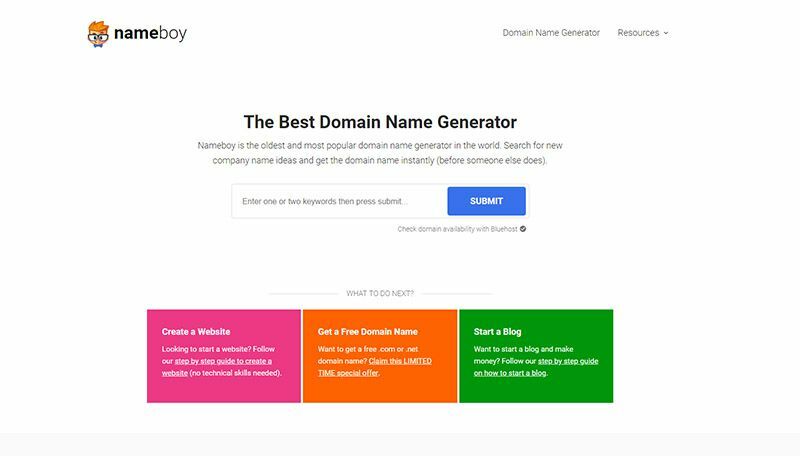 The best thing about this one is you can choose the maximum length of your domain, so avoid to generate very long domain names. You should keep it as easy and memorable as possible, right? The sad thing is the results are spread in too many pages, so you should click next multiple times, to see all the list. Well this one is good as well, the interface looks nice and it will bring you a lot of ideas, only thing it has annoying popups coming up, offering domain registration straight away, but not with the best domain registrar of course ( I will write about it in the one of next tutorials). You can get a lot of ideas with this one as well, the only thing, this also shows premium domains for $200 – $4000 as per domain, but we don’t have that money, our blog is brand new and we don’t get any income from it right now. So if you ready to invest a larger amount of money, go for it, if not, then better try any other generator above. Choosing the right name for you. Well now we get ideas from the generator, lets write down everyone we like in a list. 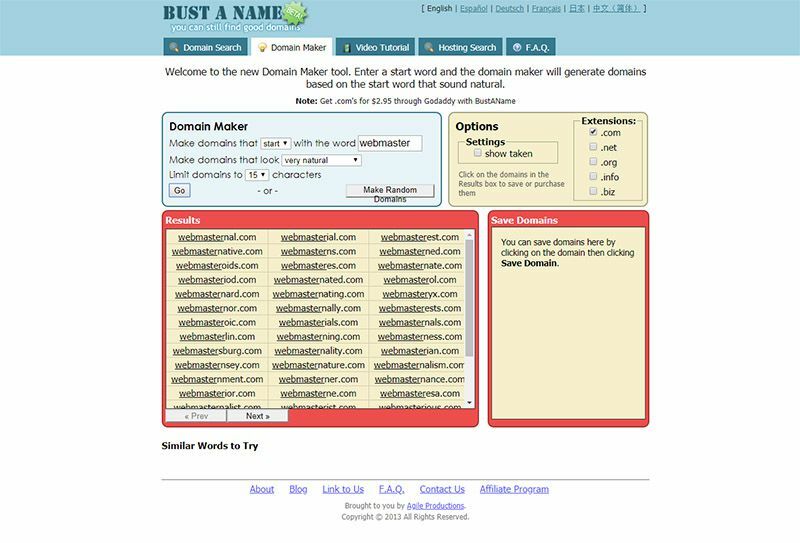 I always try to decide only on names which contain the second word after my main keyword, so my domain name will need to start with webmaster, like webmastereasy.com, but not easywebmaster.com. Now when you have written down all names you think are easy and memorable, let’s look to your list. Which words your readers will like more, which ones are short enough and which ones will describe your future blog the most. If you feel some names are not the best, stroke it out of your list and compare others again. In that way, you will probably end up with 3-5 domain names. Now it’s time to ask the community about their opinion on the name you choose. They can be your Facebook friends, real-life friends or even forum members. Just set up a quick poll and ask which name is better. 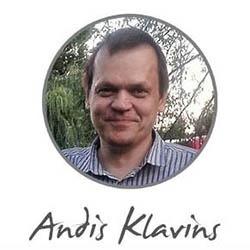 To avoid someone register one of these names before you, ask in a different way, let say “I’m going to write a book about webmaster secrets,” what name will be better for my book – “Webmaster Face” or “Webmaster Boy”? Ok, this is all regarding this topic, in next one I will tell you how to choose the right domain register for your domain. If you have any questions or suggestions about this topic, please feel free to write down a comment below. Or if you think this tutorial can be helpful for your friends, please share it, it will take only a couple clicks from you, but can be very beneficial for your followers.